I didn't have this recipe on my schedule for the week but when I woke up this morning to snow flurries and frigid temperatures, I decided it should be a soup day. Hopefully the last one of the season... Maybe?? I do live in Utah though, so it's highly unlikely. I'm guessing we have a few more "spring" snow storms headed our way, before summer decides to take up permanent residence. From ages 11-15 my family was stationed at Hahn Air Force Base, Germany. We loved Germany and I have great memories of my time there, many of which revolve around my introduction into a whole new world of food from all across Europe. But that's another story... This soup is anything but foreign, in fact that's why I think I loved it so much. You see there was this little shack outside the BX (Base Exchange - a mini department store, if you will). It was called the Potato Shack! They sold baked potatoes and baked potato soup. The simplest thing in the world, but it tasted so good to me, especially on a cold German winter day. I'm sure it has something to do with the Idaho blood running through my veins. I've thought about that soup for years, wishing I had a recipe. I knew it was simple; nothing fancy. I thought about trying to recreate it before, but new my 12-15 year old pallet was not as defined as it is now. I wasn't sure I'd really remember what was in it, or if it really was as good as I my memory thinks it was. Well, I finally decided to give it a try. I think I almost nailed it. I added a couple little extras on top, but the soup tastes pretty darn close to my memory. Bottom line...it's delicious either way. It tastes just like your eating a good old baked potato with all the fixings. The best news is that it's about 1/3 the calories and fat of a normal "cream of potato soup". I hope you enjoy! 1. In a large stock pot, melt the butter. Sauté the onion and garlic until translucent, about 3-4 minutes. 2. Add the stock and chives and bring to a simmer. 3. Roughly dice or chop the baked potato’s leaving the skins on. 4. Add the potato’s to the stock. Bring to a boil, reduce heat and allow to simmer for about 20 minutes. The potatoes should fall apart leaving some chucks, but also thickening the soup. 5. Season generously with salt & pepper to taste. 6. Add the sour cream and continue to simmer for an additional 15 minutes. 7. Serve topped with cheese, bacon and sour cream as desired. You're right, this Utah weather has put me in a 'soup' mood. 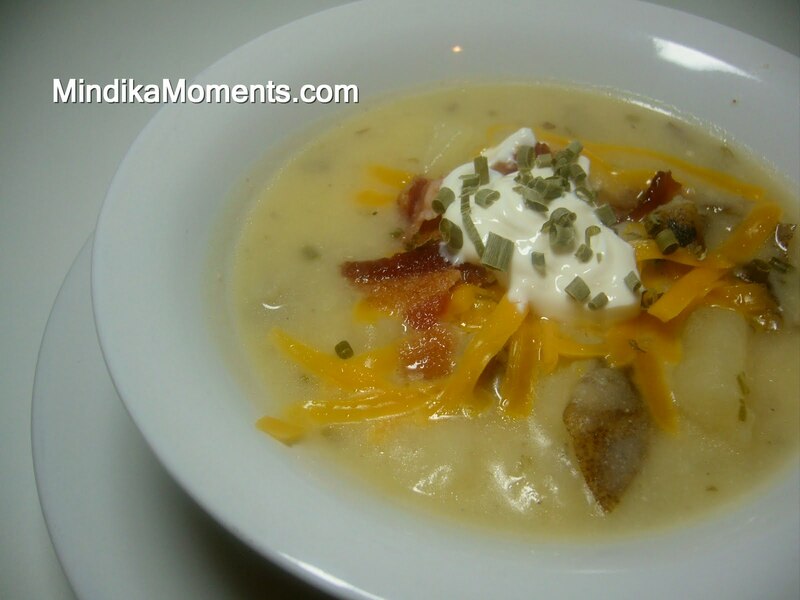 This soup is right up my taste bud alley! Oh good, I just love potatoes and you can never go wrong with a potato soup. Love it! Made it for tonight it was soooooo good thank you! You've made dinner time fun and good.